Well, I finally did it..... I made the leap from the gallery on the refrigerator door to my first time showing in public. The Mountain Art's Network sent out an email inviting members to put out their work for the day. I matted up some stuff, put together a presentation table, made some business cards, and I was off to the races! Unfortunately, the foot traffic was pretty slow; less than two dozen folks in 4 hours. No sales made, but I was encouraged by the 9 year old boy who was begging his dad to buy a trout print for $10.00. In the end, dad didn't understand that he could've purchased something that will one day be on the Antique's Roadshow (with the Keno Brother's oohhing...). One of the pieces I put in was the school of trout. It's a solarplate relief and the paper is pretty cool. Tami found some vintage wallpaper (1960's?) that had some textured pearlescent design to it. I moistened it and used the paste in it to back it to card stock because it was so brittle. Once adhered to the cardstock, I ran it through the press with the plate for the final product. Kind of unique! Anyway, now i understand what it means when they say "starving artist!" Slap on some red, white, & blue, enjoy some BBQ, cold beers, good friends, and fireworks today. Remember to take a moment to thank those who have sacrificed in order to make our nation (for all the good & bad) a little better. I don't mind saying there are some things our government is doing that I strongly disagree with, but I'm still very proud and thankful to have the opportunity and the right to express my opinion. I've been in countries where that's not always the case and it's very chilling. Enough with the soapbox.... Above are some prints from a solarplate I developed today. It depicts a giant Sequoia at Balch Park in the Sierra's. The cedar below it are all in the 50-60 foot range, so you can get an idea just how massive the trees can be. 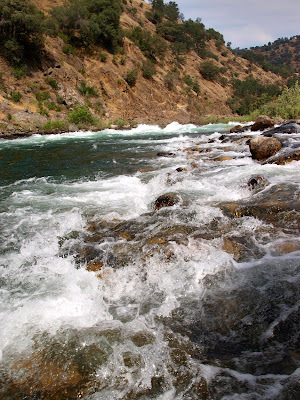 The title is not about the fact that we just finished our whitewater trip, but also about getting back some perspective. In forensic science, there's a theory that you can't pass through a place and not change it, and be inexorably changed forever. You leave a footprint, and you carry with you the soil on the sole's of your shoes. The same can be said in our contacts with others. This weekend, we had the chance to meet some amazing folks. Three ladies who were rafting and staying in the campsite next to us shared with us there triumph's and tragedies; their personal aspirations, and their genuine pleasure at experiencing the simple company of others. There was a generation separating them, but they all shared in zest for living that was nearly intoxicating. Later, on down the road to Sequoia NP, we stumbled into the Springville Inn. While enjoying a fine black ale, we chatted with a gentleman who was bigger than life. A huge man with bulging sunburned forearms that come from hard work, slate blue eyes, and a white goatee to match his silver haired crew cut, he introduced us throughout the evening to his friends as though we were his long lost relatives. He shared with us the history and local flavor of Springville, talked about fishing, and what it was like to know and rely on your neighbors. After a wonderful evening, he told me to look him up when Kyle and I head back for trout fishing in the fall so he could buy us dinner. Turns out, it was the Mayor of Springville who was our new friend. Funny thing about this vacation...... Met a whole lot of folks, but never met any strangers. 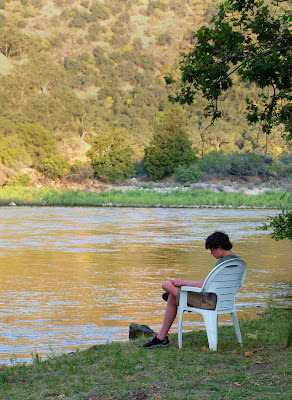 From top to bottom.... Rooster Tail Rapid, a class IV run on the Kings River; Kyle enjoying some reading time at base camp; evening on the river; the Springville Inn; Kyle with one of many trout caught.